10.30 am on Thu. & Sat. 1) A skip-the-line ticket to the Prado Museum. One of the greatest collections of paintings in the world. Admire Velasquez’, Goya’ and Bosch’ masterpieces. Your ticket is valid every day, at the time of your choosing. 2) A walking tour of el Buen Retiro Park, the green lung of Madrid, where you can explore the history of the city. Definitely one of Madrid’s premier attraction. With this skip-the-line ticket valid any day, any time, spend your time inside the Prado Museum. >> Prior to entering the monuments, a local guide will lead you through the area, explore the manicured lawns and avenues of Madrid’s popular relaxation park, seeing attractions such as the Statue of the Fallen Angel, the lake and more..
Our Skiptheline Prado + Retiro tour double feature starts on time at 10.30m and lasts a leisurely 90 minutes. Tour runs on Thursdays & Saturday, rain or shine. In English. Closed on Dec. 24 & 25 only. We meet in front of San Manuel and San Benito Church. Our tour ends at the Museum entrances. 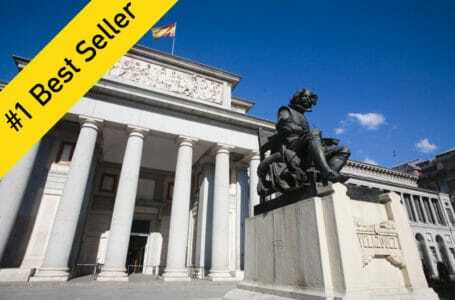 Skip-the-Line Prado Museum + Retiro Park is €45/adult (or US$49) discounted to €28 for kids 18 and under. Groups of friends, families, and school groups looking for an opportunity to share private time together often book a private guide. The Prado Museum is open every day, 10am to 8pm and closed on January 1, May 1, December 25. Our guide wears Discover Walks' pink vest. This Retiro tour ends at the doors of Prado Museum.